The Party Casino March Madness promotion offers up to 500 free casino spins, cash, bonuses plus a jackpot draw all taking place until 27th March, 2016. 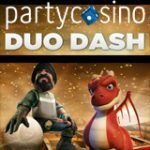 Make a deposit this March using the latest Party Casino bonus code to get a random free spins bonus. 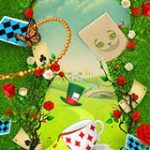 Win at least five free spins or up to 500 spins, the offer can be claimed daily with each in March. Earn points to win up to $2,500 in cash and bonuses during the weekly March Madness promotional dates. 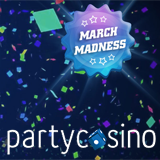 The Party Casino March Madness promotion offers players a daily Spinsanity deposit bonus, weekly prizes for earning points and a jackpot draw. Get your Spinsanity bonus with every deposit you make daily until 27th March, 2016. 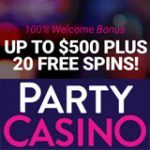 The free spins bonus features a random prize of between 5 up to 500 spins which can be played on any Party Casino slot game. After making a deposit you can check your Spinsanity bonus prize in the lobby under the Active Bonus section to claim your prize. 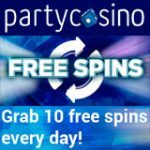 The free spins bonus is issued as a cash bonus with the value of each free spin being worth €0.30. Example if you win a hundred spins you'll get a €30 cash bonus. Bonuses have a wager requirement of twenty times the bonus amount playing online slot games before it can be withdrawn. CODEBONUS - 100% bonus up to $100 on first deposit bonus. 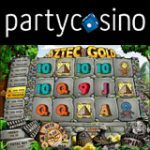 3000EURO - 100% Party Casino first deposit bonus code up to €100. 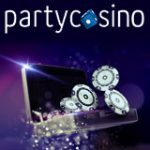 PCASGB - 100% bonus up to £100 with this PartyCasino first deposit bonus code. Win up to $1,000 in cash during week 1 & 2 of the Party Casino March Madness promotion. Earn points for the required amount of days playing any PartyCasino games to win prizes. The point requirement minimum to win a prize is just one point for two days for a cash bonus of $1. Win the maximum prize of a $1,000 by earning 400 points for seven days of the promotional dates. Cash bonus prizes must be activated from the bonus section of the lobby within seven days. Bonus wagering restrictions and details will be available before activating. During Week 2 & 4 of March Madness there will be leaderboard races where players can win cash and bonuses based on their ranking on the weekly leaderboard and loyalty level status. Bonus prizes must be claimed by activating them from the bonus section in the lobby. Complete the bonus wagering requirements before cashing the bonus. Winners will receive an email notify them of the prize, bonuses by activated before 30th March.